I'm looking to switch my body care products to more natural products, in my last empties post you saw I tried natural deodorant and that didn't work out too well for me since it irritated my skin. In April I made a purchase from an Etsy Shop and bought some natural, handmade bath and body products for my cousin as a gift for her bridal shower as well I decided to pick up some Whipped Body Butters for myself. So the Etsy Shop that I discovered was Northern Delights they had a wide selection of natural body and bath products. 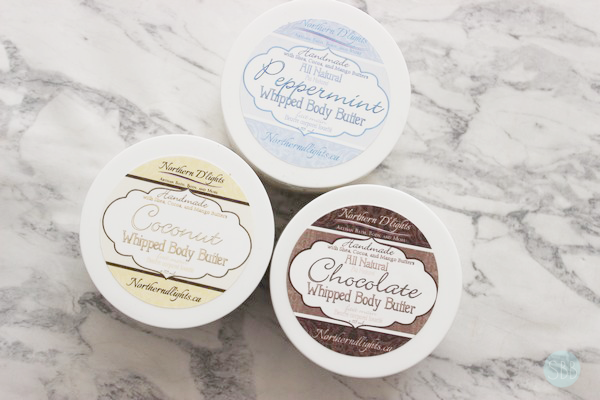 I purchased for myself their Whipped Body Butter, the three types I purchased were Chocolate, Peppermint, and Coconut. 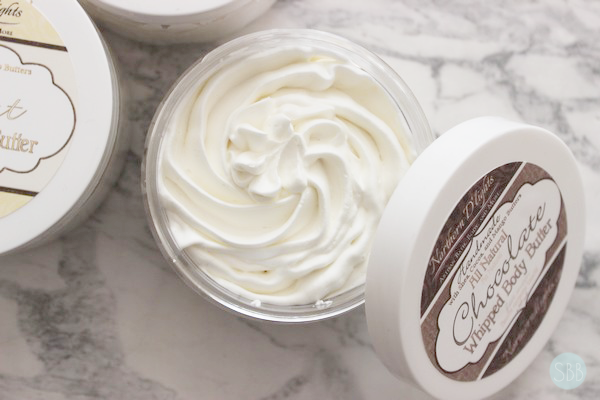 Before this I actually don't think I have ever tried Whipped Body Butter so I was excited to get my order as well I was excited about the scents of these products. They scent smell so amazing and I love that it's not an artificial smell or overpowering, they truly smell like peppermint, Chocolate, and Coconut. I purchased the smaller sizes which is 4oz in case I didn't like the product but I love the butters and would purchase more. The bigger size is an 8oz jar option. They melt as you apply the product to the skin, a little bit of product goes a long way you don't need a lot. I especially love to use the body butters on my feet. The butters are made with natural and organic ingredients listed on each product and also listed on the Etsy shop owners page. Overall I love these and would purchase more. Sadly I went back to the shop and it's currently closed I did see a message a few weeks back for the shop owner saying she was going through some personal issues and wouldn't be able to keep up with new orders, but now it looks like she has officially closed her shop. Which is sad because I think her products are great. I still wanted to post this review even though her store is no longer open but there are tons of other Etsy shops that sell natural products so I'm sure I will find a good place to purchase more from next. Just a side note if you live in Canadian I would purchase from a Canadian Shop as I was looking at Whipped Body Butters from other shops and notice shipping to Canada for this type of product is expensive. What do you think of All Natural Body and Bath products? I have never tried these, curious to try them out hun!